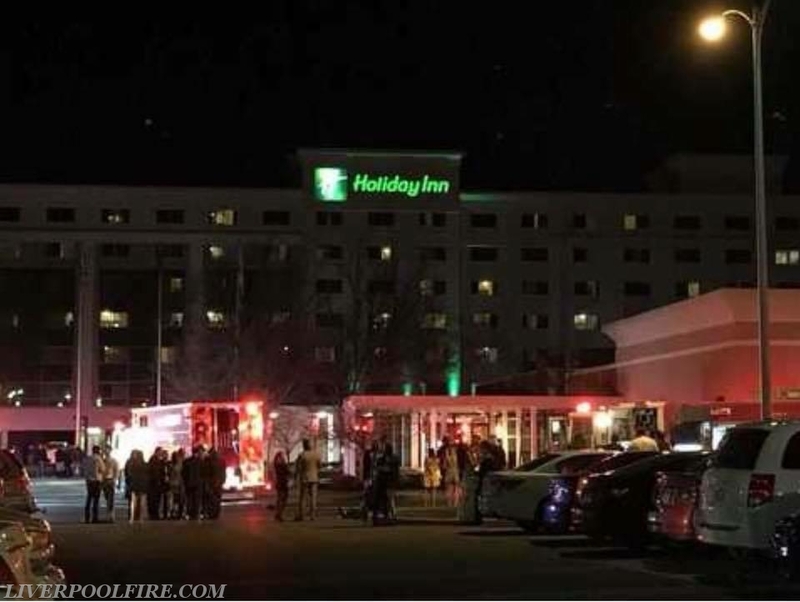 Around 2am The Liverpool Fire Dept was alerted to a commercial fire alarm at the Holiday Inn Liverpool on Electronics Pkwy. Just as first units marked enroute, 911 Dispatch reported a few more calls with active smoke and a burning odor on multiple floors of the hotel. Car 3 (Laakso) requested the assignment be upgraded from a short to a full as he arrived . Car 1 (Payne) arrived, reported a 6 story hotel with nothing showing and established command. Car 3 aassumed the operations Chief responsibilities and investigated reports of smoke on multiple floors. Engine 1 (LT Warren) was the first arriving engine company, securing their own water supply. Engine 1s crew quickly went to work investigating the first floor banquet rooms along with the basement. Hinsdale E91 was second arriving and assisted Car 3 on upper floors along with the evacuation process. Engine 1s crew along with Car 2 (Ormsby), located a burning odor and a smoke condition in a fan room in the basement. After opening up the duct work it was determined a fire started in the air handler unit. After the system was shut down, visible fire was found coming from the unit. Engine 1 stretched 300ft of 3in and deployed 2 hi-rise packs once the fire was located. Due to the extensive amount of smoke within the building multiple crews were requested in to the scene to assist with ventilation. Along with our units, Mattydale, North Syracuse, Moyer’s Corners, Solvay and Cicero operated on scene for about 2 hours before returning to service.